Re-usable packs are an effective cold therapy tool. They are pliable and soft, and available in various vinyl thicknesses, cold packs are durable and economic. We even offer specialty pediatric packs for boo boos! 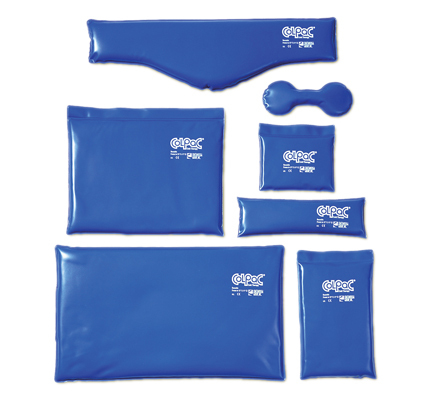 Relief Pak ColdSpot Blue Vinyl Pack - standard - 11" x 14"
ColPaC Blue Vinyl Cold Pack - standard - 11" x 14"
ColPaC Blue Vinyl Cold Pack - throat - 3" x 11"
ColPaC Blue Vinyl Cold Pack Black Urethane Cold Pack - half size - 6.5" x 11"
ColPaC Blue Vinyl Cold Pack Black Urethane Cold Pack - neck - 6" x 21"
Cold pack with attractive bear design. Packs filled with non-toxic silica gel that delivers up to 30 minutes of soothing relief of acute pain, swelling and fever.